Are you concerned that your girlfriend's menstrual flow will screw up your romantic getaway? Or that the girl's soccer team you coach will be destroyed by PMS? Selino Valdes thinks you might be, and that's why he created Flojuggler. 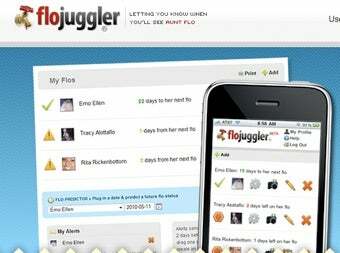 Flojuggler is an application that helps users track the menstrual cycles of the women in their lives. Or, as the site itself puts it, "Track the periods of girls you know. Seriously." Valdes clearly has a sense of humor about the Flojuggler, dropping lines like "rest assured that in the event of a hacker attack that none of your menstrual information will be used to steal your identity or make any false purchases," in the FAQ, but one wonders how much he really buys into the whole, "Get ready for that period! Ladies be crazy!" kind of crimson flow humor that knocked 'em dead on HBO comedy specials in the mid-to-late 80s. A period calculator could actually be useful for women monitoring their own cycles for changes, but to build an entire application around the idea that you should be counting down the days before your girlfriend/sister/niece/soccer team starts bleeding—and avoiding them while they are—just sort of seems like a bit much, doesn't it? The whole thing kind of creeps me out, to be honest. So what say you, commenters? Are you down with the Flojuggler? Or is this yet another step too far in the oversharing direction?